As crowd-funding becomes more popular, people are starting to use it for things beyond their album or meaningful project. Maybe you just want some people to help pay for your wedding? GoFundMe is the place for you. 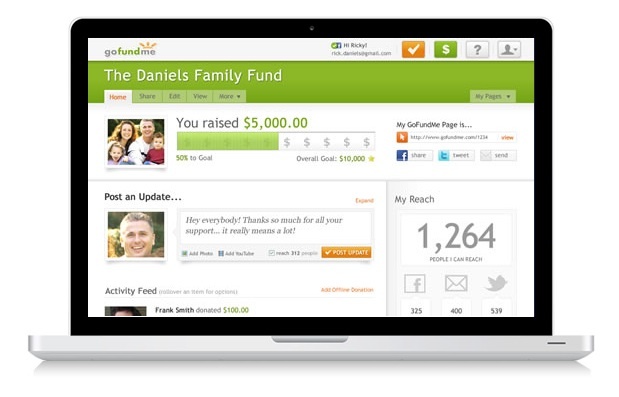 CEO, Brad Damphousse describes GoFundMe as a “human interest goldmine,” and it’s true. The “crowd-funding site for the rest of us” is, frankly, inspiring. From the 7-foot-8-inch man who raises money for more appropriate shoes, to the kid who sings his way to college, to Lucky, the tortured dog, who finds cash for vet bills, to the young woman who follows her dream of becoming a professional bobsledder: GoFundMe has it all. Started in 2008, the site is currently the third most successful crowd-funding platform after Kickstarter and Indiegogo. “It’s people experiencing the long-tail of everyday life,” says CEO Damphousse, “everything from weddings to funerals, education, youth sports, animals and pets. It’s a place where family, friends, and communities, come together to support one another.” Damphousse believes that crowd-funding will continue to “become part of the fabric of everyday life”, helping people to fulfill their dreams, and get through their worst nightmares. It’s got to be better than a message in a bottle, or those old small ads.